By the end of March, an inspector from my insurance company had submitted his report: FAIL. Unless I fixed a long list of “hazards” at the property, my insurance would be cancelled. I had two months to comply. Until then, I was on probation. Among other things, I was required to repair or replace all broken/unsecured windows (there were six of them) and repair the broken locks and broken glass in the exterior doors (two sets of those). New vinyl window installed, reframed to fit a smaller opening. We spent 6 of the next 8 weekends tracing a triangle route from our home in Auburn to Home Depot and out to the Art House in a race against the clock. The biggest challenge was finding windows to fit into the frame openings of a house built in 1901. None of the standard measurements for modern windows matched the existing sizes. I had to reframe all of the openings. For the guest room, I ended up ordering a custom window. 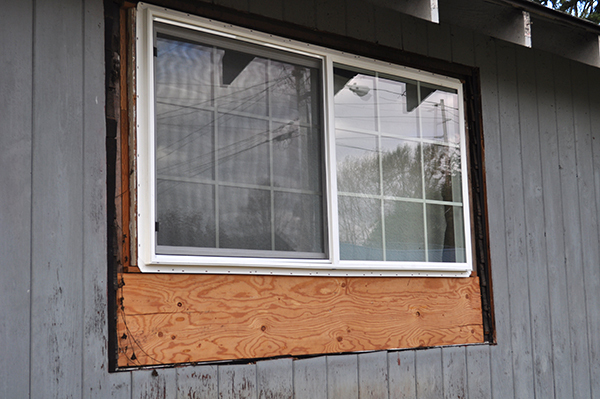 As with any remodeling project, things took longer than expected, but the end result was satisfying – and it was a pleasure to throw away the old aluminum, single-pane windows and replace them with efficient, double-pane vinyl. 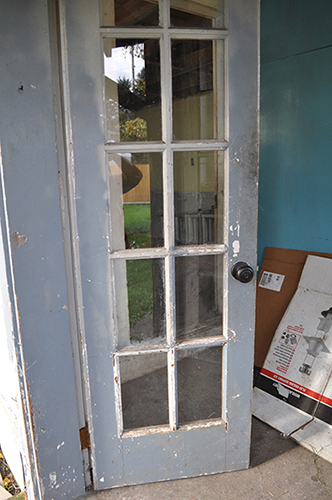 The two sets of exterior doors presented an additional challenge. I was determined to rescue them from the scrap heap. They were more than 100 years old and divided into 10 lights for each pair – with an average of 2 panes busted on each door. I removed the doors and took them home to my backyard shop. I began by removing the broken glass, scraping the flaking paint, filling holes and chips, followed by plenty of sanding. Using my router table, I used a combination of bits to recreate the custom molding around a few of the broken windows; it was either missing or damaged beyond repair. Finally, I refurbished the old hinges; I was glad to save those, too, since they were original to the doors and made of solid brass. This photo of the rear door shown here illustrates the finished result. 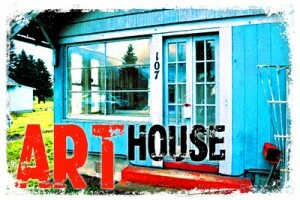 As soon as I have a chance, all four doors will be painted bright red – a fitting and dramatic entrance to the Art House. I’m pleased to say that we met the deadline of May 5th; the insurance inspector came out and submitted a follow-up report: PASS. The Art House is still ugly. But it’s insured.